For you have been given the privilege for the Messiah's sake not only to believe in him but also to suffer for him. 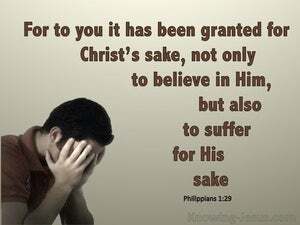 Because God has granted you [the privilege], on behalf of Christ, not only to believe in Him, but also to suffer for His sake. 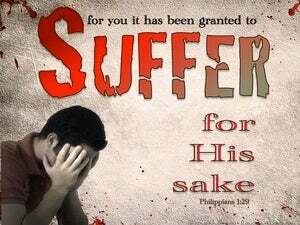 For you have been granted the privilege not only of trusting in Christ but of suffering for him. For, on behalf of Christ, you have had the privilege granted you, not only of trusting in him, but also of suffering on his behalf. 28 and not letting yourselves be intimidated in anything by your opponents, which is a sign of destruction to them, but of your salvation, and this from God, 29 because to you has been graciously granted on behalf of Christ not only to believe in him, but also to suffer on behalf of him, 30 having the same struggle which you saw in me and now hear about in me. Blessed are you when they insult you and persecute [you] and say all kinds of evil things against you, lying on account of me. And Jesus answered [and] said to him, "Blessed are you, Simon son of Jonah, because flesh and blood did not reveal [this] to you, but my Father [who is] in heaven. No one is able to come to me unless the Father who sent me draws him, and I will raise him up on the last day. So they went out from the presence of the Sanhedrin rejoicing, because they had been considered worthy to be dishonored for the sake of the name. by this one everyone who believes is justified! strengthening the souls of the disciples, encouraging [them] to continue in the faith and [saying], "Through many persecutions it is necessary [for] us to enter into the kingdom of God." And [when they] arrived and called the church together, they reported all that God had done with them, and that he had opened a door of faith for the Gentiles. having been buried with him in baptism, in which also you were raised together with [him] through faith in the working of God, who raised him from the dead. But to the degree that you share in the sufferings of Christ, rejoice, so that also at the revelation of his glory you may rejoice [and] be glad.